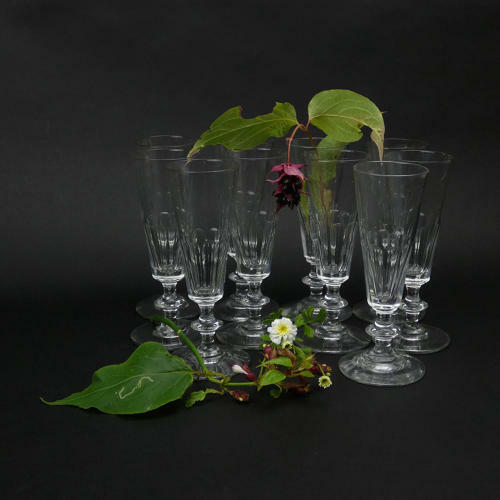 A set of 10, good quality, 19th century, French champagne flutes. These are not crystal but they are good quality and they date from c.1890. Each one measures approximately 16.2cm. (6 3/8") high by 5.6cm. (2 1/4") diameter at the rim and 7cm. (2 3/4") diameter at the foot. There are very marginal differences in the dimensions of the glasses in this set as they are all hand blown. They have a simple, long, cut design to the flute and a single knopped stem. They are all in excellent condition.